My favorite anime of all time! I made this wall, but then had to edit it into this version because the staff was cut off. It has some empty space, but, bleah. It has blue, .hack//SIGN, and Tsukasa in it, so I am perfectly happy! I like the art. That is about it. I'm not really fond of the background, sorry. 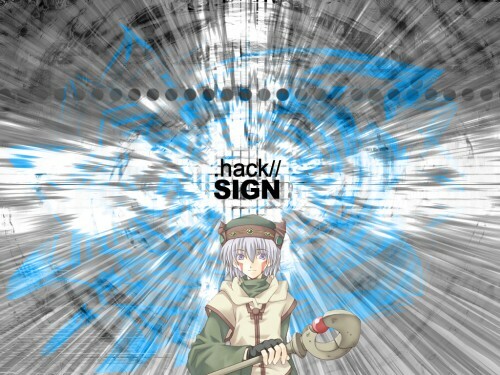 BG is a bit chaotic, but it works nicely with the theme of Hack sign ^^~ Keep it up! Maybe some more touch up on this wallpaper would be nice. Haha. I like it anyways. Tsukasa is awesome! Thanks for the Wallpaper! having a good background is actually quite important, and you've done it! congratulations and thank you!! !